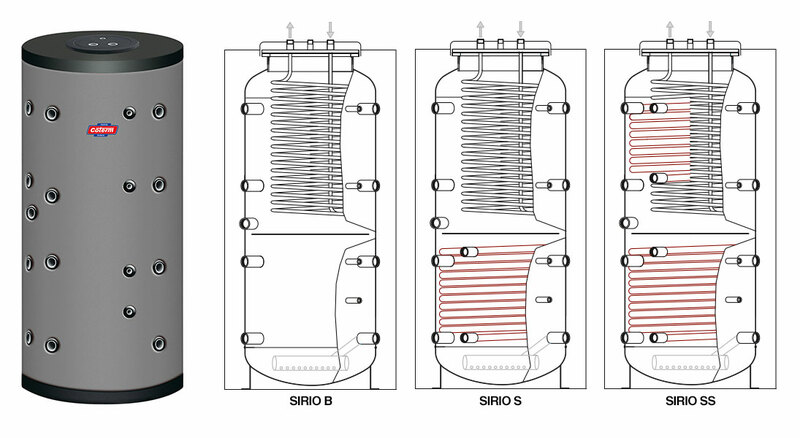 The SIRIO series domestic hot water storage heaters are equipped with a flow diffuser combined with a separator that allows a perfect stratification and the capacity to draw water at an ideal temperature at the various usage positions. The storage heaters are available with no coil pipe, or with one or two coil pipes to be connected to alternative sources. In the upper part of the boiler there is a removable coil pipe in AISI 316 stainless steel for the instantaneous production of domestic hot water: with the smooth rigid tube for the exchangers with a surface area of up to 5 m2, with a corrugated flexible tube for exchangers with surface areas up to 8.50 m2. The inner part of the tank is unfinished, while the exterior is painted with a water-based rust-proofing. The insulation, in soft polyurethane and 100 mm thick with exterior coating in PVC, guarantees that the water is optimally insulated, thereby minimising heat dispersion. Fill in the form below to be e-mailed the SIRIO B – SIRIO S – SIRIO SS SERIES BOILERS technical data sheets. Thank you.